Ya know, for a moment there, I really was interested to know not only if a kitten could survive inside a python, but the backstory behind how a python got to eat the whole kitten whole in the first place. And then you had to dash my hopes of finding out something interesting only to make a funny. Thanks, I appreciate it. Jerk. RPM Challenge Update: Streaming audio is up on the RPM home page, featuring one song from each of the 850+ albums submitted. This is not the full player containing all the albums; that was previewed last night, but still in testing. Coming soon. Is it kosher to sell your MeFi account to someone else? So where is this weeks podcast? 2-3 weeks ago I posted a song to music. It's no longer there. I assume it was deleted. Of course, there was a perfectly good reason why it was deleted. It would be nice if you notified me of this action, the reason why, and allow me to respond before the action was taken. "There have been 45 questions and 600 answers since your last visit. Click here to go to where you left off." Ticked off at replies to "Irrational pregnancy fears". From Ask: Why are so many saying that she must not know the facts of life and is it just me who finds this to be pretty rude? 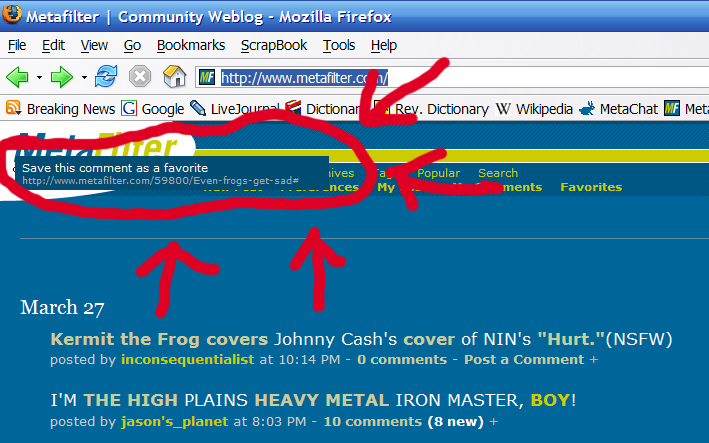 I was wondering if Metafilter had a MacGuyver Rule. In my favorite posts/favorite comments page, the links inside my favorites posts are retained, while the links inside my favorite comments are stripped out and rendered as plain text. Would making a torrent of jonmc's list of 300 songs be a good idea? If that's okay with jonmc, of course. MeFi Music is working again, but we lost every uploaded song from March 22 until now. I've set the threads to hidden, but you have two options: re-upload as a new post, or email me the mp3 so I can restore it. RSS gone bad? Metafilter Jobs, Ask Metafilter, and Metatalk are showing front page Metafilter posts instead of their respective posts. I'm using Google Reader, if that matters. I tried adding the feeds using Sage to see what was up, and it finds feeds but won't find any actual posts. Wish we had a follow-up on this thread — guy sounded like a psycho (as you might imagine from my response). The user apparently hasn't posted since then. For fans of the Laughing Song thread, there's a mention of George W. Johnson as well as other early African-American recording artists over at NPR's The Story. Photos and song samples there, too. I'd include a permanent link to the actual topic, but have so far not found one. Ooh ooh- I've got an idea. Picture this- you open a thread (AskMe or MeFi), and at the top of the thread, there is a small note that says "This thread is currently being debated in MetaTalk. ", with a link to the MeTa thread. This way, people have no excuse for taking a big steamy dump in threads. People posting MeTa complaints could fill in a field with the post ID, and some database magic could occur to link the two. Just floating this out there to see what others think. 100 / 1000 / 10000 / 20000 / 40000 - yet 30000 and 50000 are suspiciously absent. Coincidence or conspiracy? You decide. Is this happening to anyone else? I view a post, click back, and there's that little window hanging over the MeFi logo. Eh? The clear and (I believe) complete instructions for the MetaTalk sidebar meetup pointer feature don’t mention how one reschedules such a meetup. This is relevant in the recent Berlin thread, what with flying visits to this non-English-speaking city and so on. How judgemental is it OK to be in an Ask Metafilter reply? If someone wants to know how to game the system to continue being a public menace, is it OK to point out that it's not in our best interest to help? That, in fact, it could arguably be aiding and abetting future lawbreaking? Or is that nyeah nyeah? Not rilly a meetup proper, but I definitely wanted to invite my MeFi bredren an' sistern to a talk I'm giving in NYC on April 9th. Details inside. I know there have been several (unsuccessful?) attempts in the past, but is there any interest in a Berlin, Germany meetup? This anonymous question showed up on my list of "posts by divabat saved as favourites". I didn't write that post. Exactly why did this stay up on MeFi? Posted 1 hour ago by stbalbach. As interesting as I might find the contents, technically this is a self-link. The main link is to something he himself uploaded to another site. Perhaps the problem is not MeFi, but you. Episode 4 of the MetaFilter Podcast is now up, featuring recaps from me and jessamyn. I'd like to take the time to invite everyone informally to #mefi on slashnet (irc://irc.slashnet.org/mefi)! Ops for everyone! Please check your discontent at the door. That is all. You guys are totally bumming me out. The Web 2.0, it vibrates? This has occasionally been mentioned before, but are the tabs on the front page currently serving any purpose? The functionality of 'Recent Posts' seems duplicated by the home page, 'My Favorites' by 'Favorites', 'Popular Favorites' by 'Popular', 'My Comments' by, well, 'My Comments'. 'Recent Comments' I simply don't find useful, but that may just be me. UbuRoivas has cable! (USB, that is). This allows me to post the remainder of the pics from the recent Sydney meetup, featuring our own celebrity librarian. No more pictures in profiles? Have we lost the ability to post pictures in our user profiles now? Make askme more of a reference page? No officer, I'm not small. I'm TALL! Can the RSS feeds be hidden from Google? They're pretty much useless in search results (like the first hit on this one). Preferred method of quoting others' comment? What's the proper method for quoting a commenter in a thread? For years, I had taken to just posting the thought in italics and nothing else. More and more however, I notice people pulling out the quote with the post date/time and user name. Are both methods acceptable? Neither? Better to link to the comment in question and not quote it at all? Please hope me. Can the anchors in the "posted by" line have a different link/visited color than anchors people put into either the post or their comments? I used IBM's Many Eyes data visualization site [discussed] to create a network map of my MetaFilter contacts and my contacts' contacts. It got to be pretty big, so I thought I'd post it here. The Bat Signal is broke. What is the protocol for contacting another member for something friendly and (admittedly) trivial if they don't have an email in their profile? "I am in therapy, and my therapist has agreed with me that Ask MeFi has resulted in some really intelligent and meaningful answers before." Nice feedback for AskMe. Just curious about something... when someone answers an AskMe question and it gets marked as one of the best answers, shouldn't that also count for them as being favorited by someone? Or... no? closed closed closed closed closed closed closed What is the deal with every fifth or so MetaTalk thread being closed? Yes, some get messy, but that is where issues get worked out. The petulant pres closes off discussion because he can't handle it. Why does MetaTalk all of a sudden close all these threads? MetaTalk can handle it. Update: Registerfly's accreditation has been terminated by ICANN. Tiny text is hard to read! New York meet-up photos, if you please. Closed for archive on the same day? Why is this thread closed for new comments? A rather interesting discussion was brewing on desirability vs. feasibility. City of the Big Shoulders MeFites: Soon comes my first foray into Chicago. I'll be there for business reasons, but headed out a few days early to enjoy the weekend of April 27-29 as a tourista. Any chance of a meetup? The Front Page Posting page shows a big blob listing ALL the tags I have used on previous posts. Particularly big because I have made 199 posts on at least 175 different topics, including high-tech band-aids (an early NewsFilter with 2 now-dead links), a-list blogs, MetaFilter-related stuff before MetaTalk existed (this post features jessamyn making a suggestion to create something like MetaTalk) Interpol, Steely Dan, ICANN, and Fat People (without a trainwreck in the comments!)... and that was all in my first month participating here. Anyway, that tag blob, as it now exists, does me no benefit and just blocks the way to the "Preview" button. Can we have options to show NO tags or most used tags or tags used more than once ple-e-e-eze? These days mefi tags all look about the same size (Opera 9.x, OS X). Is tweaking the math easy enough that the tag sizing could once again be a useful indicator of relative popularity? If not, no biggie. MeFi appears briefly on the video on the final page of this entry about this prank. Will it all kill me? How AskMe made me stop worrying and learn to love food poisoning. Just thought I'd point out this above average comment from yesterday's excellent post on Northern Elephant Seals, for those who may have missed it. Joost has been mentioned here, althought I can't find the post about it. I have two invites that they are threatening to expire on me. Anybody want them? First two emails I get can have them. Email in profile. Removing Favorites At Point Of Origin = YAY! I've noticed it's now possible to remove favorites directly at the post/comment. Very cool! Thanks mathowie! Is this suitable for AskMe? My post early this morning was deleted because cortex says "What, was the previous thread that you linked not contentious or web-unrelated enough?" Are we a bunch of politically correct nerds? Second page of favorites does not list favorites. PonyFilter: It's annoying to click on the same link twice in a post. How about sending the New Post form back for the user to "fix" it? So despite reading the MeFi Wiki and crunchland's profile, I managed to screw up my FPP ( this one ) and it now appears on the home page without a title. Would one of the admins be kind enough to correct the link title of the post? You may also suggest suitable means of atonement for this extremely n00b-ish screwup. I've got my timezone set to UTC but Meta thinks it's 0.25 on the 14th when it's actually 23.25 on the 13th. Is this a 2k7 date hack that's fecked the site up for all non-Americans, or has the time gone wrong for everyone? MetaFilter got beat by PostSecret. ask.met... er, I mean provoke.metafilter? Is this in any way acceptable? By which I mean posting a question that you "know" will be flame-bait, and then taunting those who answer? Anyone want to set up a NC meetup so that I can crash it? Or just put it on AskMe. Can someone please change the text of this FPP on Heroes so it doesn't refer to the name of a well-known comic series with a similarly well-known plot? NoBiggieCuriosityFilter: I run a t-shirt website, and I've noticed a significant bump in traffic today coming in from this askme post I made a while ago. While I normally get a few randoms in from MeFi a day, this seems significantly larger then usual, which I can only assume is because someone somewhere else is linking to that ask me question and generating traffic for me second hand. I'm really just curious about it, and am wondering if any of the admins would mind taking a quick look at where they are coming from for me. If not, no Biggie. MeFi Fantasy Baseball '07 needs YOU! There's a flag for "fantastic post". Is that used for anything, or have favorites replaced it? Take the Shame out of Shameless Self-Promotion on Metatalk. We need to come up with a solution so that people who post their gigs don't have to pretend they're "Metafilter Gatherings" or "Metafilter Related," and so that they don't get accused of shameless self-promotion or whoring themselves on Metatalk when they post messages such as this or this. They don't quite fit into Projects, but they don't quite belong in any of the categories here. AskMe in google search results. So, is anybody else noticing that askme is showing up more often in google searches now that the title is in the URL? It seems like any kind of obscure search I do now has ask metafilter entry somewhere in the top 5. Mefite group art project: passing around disposable cameras. Pics from our little AZ meetup. Pictures from the Sydney meet-up at the Australian Hotel. Good times had with Jessamyn and her sister, as well as the Sydney contingent. How can I get y2karl's informative pop up title tags to fit my browser window consistently? On the current post the prospect magazine snippet is an almost square box - which fits fine - and the NYT snippet is so wide that I cannot read it all. Where does the via go? Dear Mefi. What is the proper etiquette for the [via]? Some go inside, others on the front. When logged out, posts to Music and The Blue lack the timestamp inside. I'd like to nominate this fantastic, almost entirely civil thread about Mormonism for the sidebar. It's really been an exceptional example of how informative AskMe can be when discussion and knowledge-sharing are maximized with minimal interpersonal snark. Hey, New Yorkers. I'll be in town soon and noticed you haven't had a meetup in a little while. Anyone interested in something either next weekend (of the 17th) or the early part of the week after? Cortex followed us home. Can we keep him? Cortex has been a great mod so far. I motion that he be granted perma-mod status. Can I get a second? When I'm looking at a user's page and click the timestamp of one of their MetaTalk comments, the link redirects to the original post instead of the user's specific comment. Does this happen to anyone else? What happened to the thread of photos off the p2p networks? Did that link get removed for any particular reason? Was it to make room for the Zelda/Golden Ratio thread? Hmm. I am kind of disappointed. TechCrunch posts about Google Answers rising from the dead (as UClue) and mentions a few more question-answering services. Still none as good as AskMe. Jessamyn will be in Melbourne on Saturday night. So. Melbourne MeFi meetup on Saturday 10 March. Let's do stuff. More inside. Chicago! I'm calling you. Yeah, I know some of you had a meetup about two weeks ago, but I'm coming there for business (and working there over the weekend.) I'll be near State & Grand...and I'm thinking friday or sat night might be nice. I'm thinking round 8 or 9ish. Somewhere positive to discussions with alcohol. yes, I would like to know what's in your mouth! Hey everyone! It's Tuesday afternoon, I'm just chillin at home. Happy post-whatever-crap-you've-eaten-lately day. It's pretty minor, but an & in the post title turns into 'amp' in the url. example. What's the best way to listen to all the songs currently on the front page of music.metafilter.com as a continuous playlist? Any suggestions? Is there something I'm missing? If there really is no way to do this currently, could I suggest some dynamically generated playlist page, that operates like existing playlists, but takes you through, say, the last 50 tracks. Maybe it will do better than the orkut group. I went and created a Metafilter social group on Ning. I imagine it as a convenient place to put photos and videos (and maybe tools, like greasemonkey scripts etc.) all in one more or less neat little pile. If that doesn't catch on, at least it won't be used for anything evil. Just posted this http://ask.metafilter.com/58158/Rats-in-the-car And the preview looked fine, but the final posting is one paragraph and hard to read. How can I correct it and did I do something wrong? This AskMe helped us get LOTS of kids into the movies. Some photos. Mea Culpa. Remember my sweet-and-sour pork stamp post? Well, as it turns out, it's not true. Oh, there is a stamp (cute design), and it is popular, but it's not scratch-and-sniff, or tasty (see comment #7). Sorry gang. P. S. Not a "bug", but that's the closest Category that came to mind... P. P. S. I had a friend of mine ask her relatives to send her a sheet/book of these stamps. I just have to know for myself. Fans of Dylan Hears A Who might like to know that the page now contains links to a zip file of the all MP3s, plus a CD insert and tray card. Jessamyn in Sydney! As part of her tour of the Great Libraries & Librarians of Australia, Jessamyn will shortly arrive in Sydney for a few days. A meetup has been suggested for next sunday, 11th March. As she will be staying near Whitlam Square, the tentative plan is for a stroll through Hyde Park & the Botanical Gardens, then perhaps hop onto a ferry to Doyle's. The last ferry back from Watson's Bay on a sunday is at 7:05, arriving Circular Quay at 7:30, which coincides nicely with a 7:20 sunset. This is not something we should do. Regardless of our belief system, asking the group how to break the law is not the intended purpose of AskMe. music problem: 50% of the time I try to upload a standard MP3 (ID3 v2.2), I get the following error: The MIME type of the uploaded file "application/x-octet-stream" was not accepted by the server. This potential suicide question concerns me as it has anyone who read the thread. I don't know what follow up is needed, but perhaps more visibility here will offer some direction? Tragic news from one of our own. May I be the first to suggest we get a best answer for this question and make donations as a group? I don't know what else to do. Ideas? When I go to "my posts" and then try to select "activity threshold" one month, the page always refreshes as 24 hours instead of one month. I can choose any other increment of time no problem. I'm using Firefox 1.5.0.6 (5.0?) whatever that means on a Mac. Thanks. No podcast this week? I'm guessing I missed the memo. When can I post a question? The New Question page on AskMefi is giving me conflicting information. First it says that I have 7 days 15 hours (etc) to post, then one countdown says I have 15 hours left, then there's another countdown which was constantly changing between the two, but as I type this it's settled itself to 15 hours. (One of the countdowns is from a GreaseMonkey script). Which is it? Is it fair to consider the number of comments an FPP receives as an indication of community interest in the post? If so, then it is a pity that eustacescrubb's great find (a real best of the web IMHO) gets only a handful of comments whilst yet another FPP about Ann Coulter frothing at the mouth generates so many. Metafilter Music Remixed: With all the talented musicians floated around here, would anyone be interested in setting up a remix thing, where metafilter musicians remix other member's work? I know that this is an issue best addressed by the creator of MetaFilthy, but before I email him, I wanted to make sure that it's really a MetaFilthy bug, and not some problem on my end, and Metafilter is pretty much guaranteed to have the internet's largest population of MetaFilthy users. So: Is anyone getting a MetaFilthy bug when they open a MeFi page saying "Exception in Metafilthy.showIfValidURL NS_ERROR_DOM_INDEX_SIZE_ERR Index or size is negative or greater than the allowed amount line 1012 of undefined undefined"? Jobs' spell check is buggy. Spell check be giving me a CFM error in Jobs. Metafilter + bacon = delicious/WTF? Sorry if this has been addressed before, but I am logged in and see ads from fmpub.net on the front page. The ad presently displayed invites me to "chew the fat at serious eats". It's the same ad after multiple refreshes also. While I am a fan of bacon, I don't normally see ads when I'm logged in. This is all the more curious given that I'm using adblock plus and don't usually see ads on any site. Is this a temporary thing, or is bacon now an integral part of the site? Mefite albums and attempts from RPM07? RPM Challenge, post-game: February is dead and gone, and a bunch of us either finished an album in a month or didn't. Let's have the dirt, folks. And the links. And some Music posts. Ok, so now that February is over, what happens to the AskMe posting limits?